Freddie is now at the age where he loves interactive toys. He's been concentrating a lot more these past couple of months and takes a lot more interest in interactive toys nowadays than he used too, especially if they make sounds and play music. 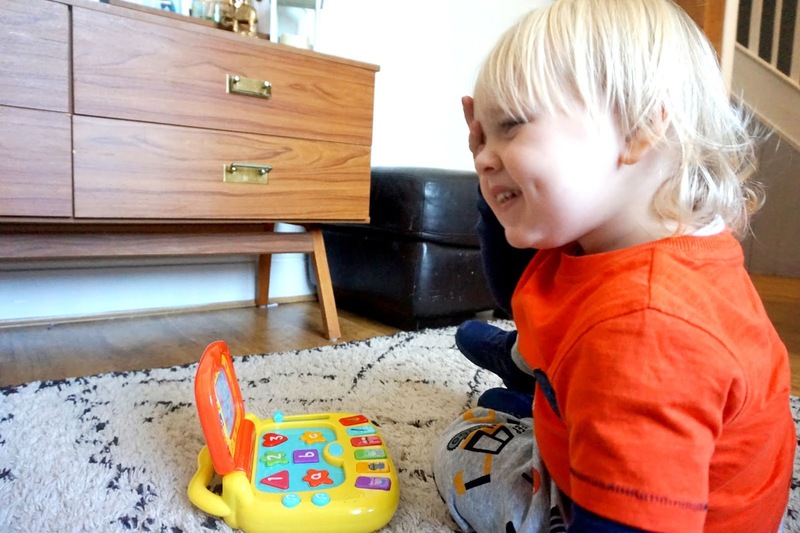 When he received the Peppa's Laugh & Learn Laptop, he was so excited. He instantly played with it and has been playing with it ever since. It's probably one of his favourite toys he loves to play with and carry around with him. Peppa's Laugh & Learn Laptop features four game modes that relate to colours, numbers, letters and word recognition. 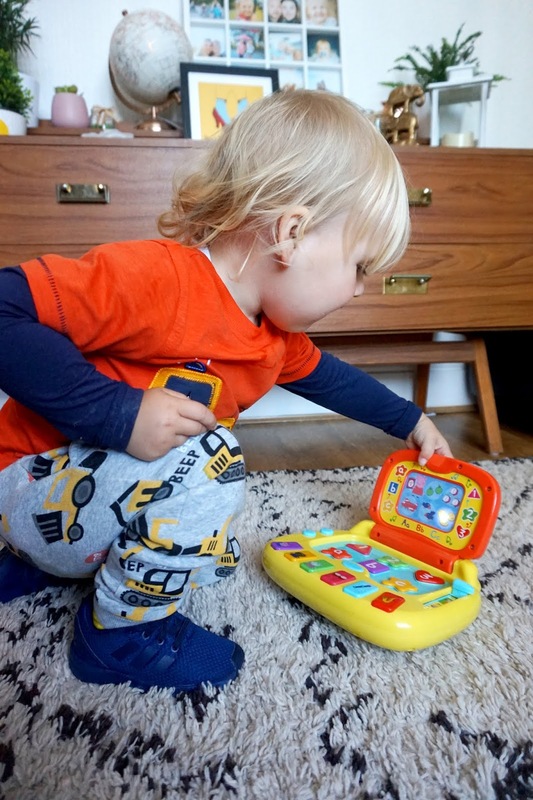 There are fun shaped buttons that Freddie loves pushing, which then makes lights on the screen that helps the child navigate and answer different questions and challenges. 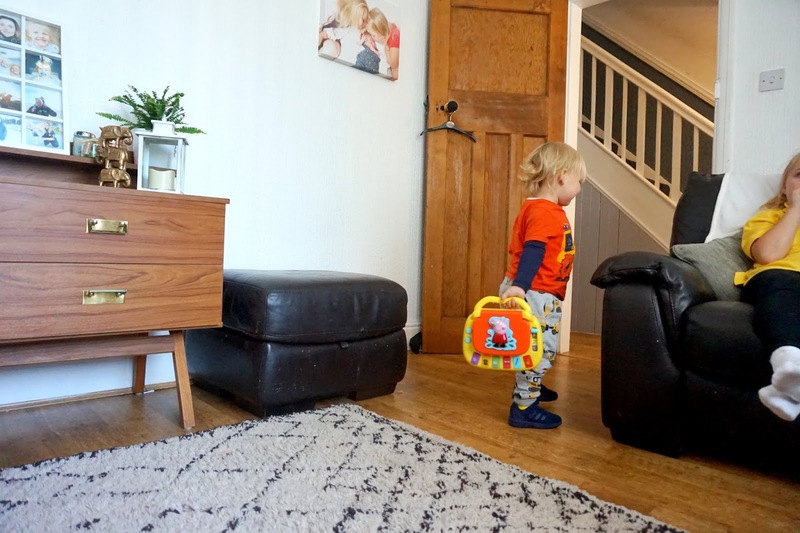 There are some musical sounds your little ones will love and dance around too - if they are anything like my Freddie. The classic chunky laptop design has a handle for your little ones to carry the laptop around with them. 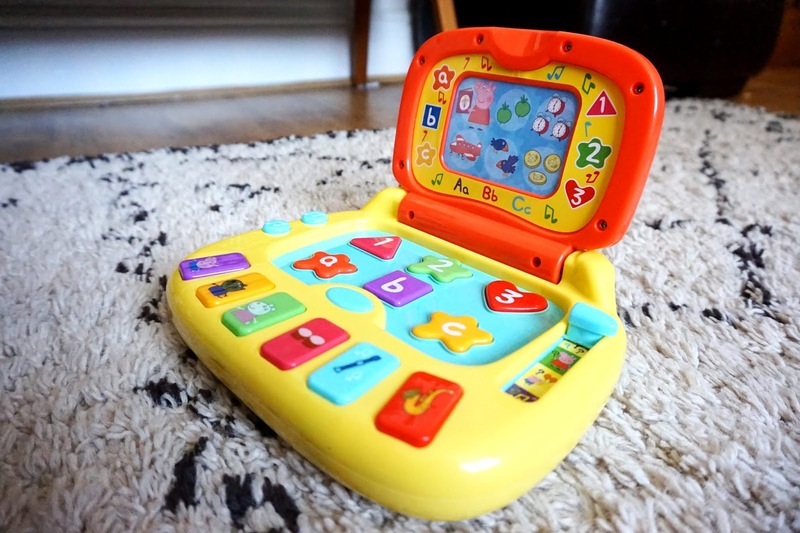 The foldable screen lights up, and the buttons are chunky, great for little fingers to press. Your little one can learn different musical instruments and play 4 different activities, including sounds and words etc., when the easy-to-press buttons are pressed. It's a great gift and toy for your little one to have to help teach them the basics of vocabulary, communication skills and hand to eye co-ordination. It's great quality, perfect for toddler/young children. The best thing Freddie loved about this laptop was carrying it around and pressing all the buttons for the lights and sounds. Now here's the fun bit for you all. You can now win your very own Peppa Laugh & Learn Laptop! Whether it's for your little one, a friends little one, your nephew/niece or anyone. All you need to do to enter is enter via Rafflecopter and make sure you read the Terms and Conditions. Good luck! Giveaway ends 30th September 12AM UK Time. I would give it to my little niece. I'd give this to my wife. My great niece - looks like a lot of fun! I'd gift this to my niece! The children would love it. I'd give it to my youngest son. I'd give it to my daughter because she loves peppa! My Niece, She would love it! My great-niece would be the lucky recipient. She loves Peppa. I'd give this to my youngest god-daughter Florence. She'd probably take it to bed with her. She loves Peppa. I'd give this to my son for his birthday. He's a big Peppa fan and loves stealing my husband's tablet. I would love to gift this to my nephew who adores Peppa Pig. I would give this to my Daughter. She would absolutely love it.